Hi, everyone! Hope you are all enjoying a great summer. It has been really hot this summer in Michigan. I am not really a hot weather gal and, with my continued dizzies (neurologist appt next week! ), I’ve been inside a lot. In honor of my never-ending quest to keep reinventing myself, keep evolving, keep challenging myself, I dared to write my latest book, revealing a side of me that I don’t talk about much. Some of you know that I was molested as a kid and endured some pretty horrific intimate crimes as an adult. As much as I cheer us who have been brain injured, I, too, cheer those who have suffered the life-altering hells of intimate crime. This new book is for women, primarily. Any women, really, but mostly for those who have yet to start or are already struggling in the tangled mess of wrongly-chosen mates and mismatched relationships. Within a week or two, I will also be announcing the release of my second newest project: ta da!!! After so many years of struggling to get the original, “I’ll Carry the Fork!” onto audio, it will be released to Audible, iTunes and Amazon along with the audio of the book for empowering women. These dizzies, as I’ve mentioned before, have reminded me of when I was first brain-injured. After 7+ months of this now, it feels like the world has moved on. Like I have adapted to it. Like the initial belief that it would be cured soon has faded…. But I’m quicker this time around. Better armed. As you are. I know now that I have the ability to continue to adapt and to reinvent, as needed. I can do this. 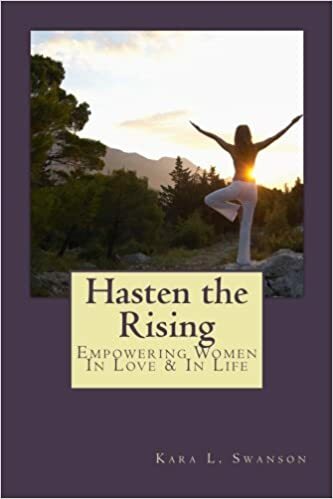 I hope you’ll enjoy the new book, “Hasten the Rising-Empowering Women In Love & In Life” I’ll be back in a couple of weeks to announce the release of the first two books as audio books. Hoping that those of us who are challenged to read can enjoy it/them. Keep reinventing, you guys. Keep reminding yourselves, each day, that you can think yourself around this brain injury and invite new versions of your awesome you.